To keep track of what I am selling and where, I made a spreadsheet. Column B is the starting price. Columns C-I are places I have listed for sale. The bold dates are the original posting for that item, and non-bolded dates are the most recent “bump”. Column J is how many bumps, so I know that I’ve tried. Some communities only allow bumps every so often. Column K: When I will next bump. Column L will be to show what has sold and possibly when. Column M is when I’ll give up on selling the item. Column N is where the item will go if it does not sell by the date in column M.
This makes for an END IN SIGHT, helping me feel better about the amount of boxes and things that I need to get rid of. 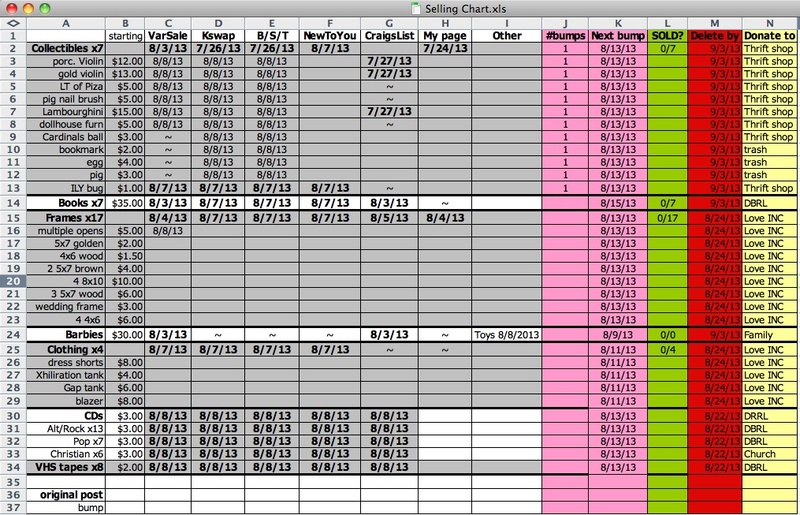 This entry was posted in Organization, Selling online, Spreadsheet and tagged cleaning, declutter, Excel, excel spreadsheet, organization, organize, organized, selling online. Bookmark the permalink. Love it!! This inspired me to make a finance spreadsheet!! This is an awesome idea! I just might copy!